Travel in and around Aurora with your group in an updated, reliable motorcoach rental. Champion Charter Bus is the top-rated group bus rental company in the Western United States, providing efficient transportation solutions for groups of all sizes for trips of all kinds. Our 24/7 team is ready to help you plan your trip when you call us at 720-222-3405. Don’t let transportation hold you back on your trip in Aurora. With the largest network of bus rentals in the West, Champion Charter Bus can make getting anywhere with your group easy and fast. Whether it’s for a private trip, school excursion, corporate event, wedding, senior group, or more, we’ve got your transportation covered the entire time. We service a majority of major cities, including Phoenix, Scottsdale, Las Vegas, Los Angeles, San Francisco, and more. Our network ranges from 18-passenger minibuses all the way to full-sized motorcoaches that hold up to 56 passengers, meaning we’re sure to find your group the perfect bus. Many buses come standard with premium features like reclining seats, air conditioning, WiFi, power outlets, and more for a comfortable ride. Ready to get started? Call our team at 720-222-3405 to learn more about how we can help you. Whether you’re coming from Denver or visiting Aurora by itself, traveling with a group for a private trip is always easier with a personal bus rental. Champion Charter Bus takes care of all your travel needs so you can fully focus on trip planning. Close to many beautiful parks and hiking spots, Aurora attracts thousands of outdoor enthusiasts each year. Pack your bus with your gear and fellow adventurers, and we’ll drop you off directly in front of Cherry Creek State Park. Or, visit the Wings Over the Rockies Air and Space Museum to learn about the exploration of flight. Either way, we’ll take care of all the navigation, traffic, and parking while you enjoy the ride. Without your attendees, your event wouldn’t be as special as you’d like it to be. With a dedicated method of transportation your attendees can rely on, getting lost or arriving late won’t be an issue. Champion Charter Bus works with event planners of all kinds to organize efficient transportation for weddings, corporate events, military and government functions, and more. If you’re planning a corporate event at a big venue like The Summit Conference & Event Center, organization is key. Ensure employees and clients arrive on time and ready for a successful event with a professional charter bus. With an all-black interior, WiFi, power outlets, and more, there’s no reason no one should arrive feeling anything other than motivated. Shuttle guests to and from their hotel to your wedding in a stylish, comfortable minibus rental. Have guests coming into the Denver International Airport? Make sure they’re there for your big day with chauffeured services. With transportation taken care of, every guest will have a chance to be a part of your celebration. Charter bus rentals are a viable, safe alternative to dated, uncomfortable school buses. We’ve worked with schools and colleges across the state to provide reliable transportation for field trips, away games, campus tours, and other school events. With air conditioning, reclining seats, and on-board restrooms, your ride to the Aurora History Museum will be completely comfortable the entire field trip. Stay entertained with flat-screen TVs and DVD players, and spend quality time with your students knowing your professional driver will handle everything else. 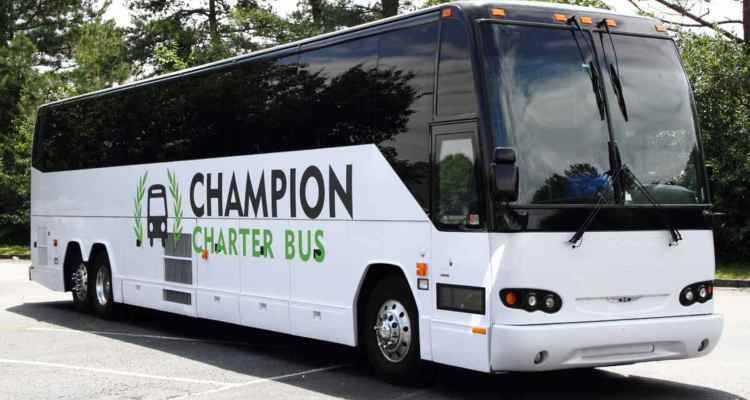 Become the next champion with Champion Charter Bus. Traveling to an away game with your local sports team is fun when you do it together. Ride in a spacious charter bus and prep for the game ahead. With plenty of storage space in luggage bays and overhead bins, no one will have to leave anything behind. No matter what kind of trip you’re planning, let Champion Charter Bus help make your journey easier with streamlined bus rentals. Our 24/7 team is always ready to help you plan your perfect trip. Call us at 720-222-3405 for a free, no-obligation quote.